How evil began in a world created by a good God? That your conscience is exactly like your eye? That you can break the power of black magic & witchcraft? That you can talk to God as to a loving Father? That you can overcome every problem with God's help. One of the greatest mysteries in the world that people have tried hard to understand is the mystery of evil. How did evil begin in a world that was created by an all-wise and good God? Why does evil have the upper hand in every part of the world? And why is there so much sickness, poverty, sorrow and suffering everywhere? Is God not interested in helping us? These are questions that need an answer. And the Bible gives us an answer. But before we proceed further, let us be clear about certain facts concerning God. God has existed from all eternity. He had no beginning, for He lives beyond the limits of what we know as time. That may be difficult for us to understand. But that is only because our minds cannot contain God's wisdom - just like a cup cannot contain the water in an ocean. The Bible does not even try to explain the fact that God existed from all eternity past. It just states it as a fact. God is revealed in the Bible as One Who desires a personal relationship with us human beings. He is not a man, as we understand persons. He is Spirit, infinite in every way and unchanging at all times in His character. He is all-powerful, all-knowing, infinitely wise, infinitely loving, and infinitely pure. God's infinite love is totally unselfish. And so from the very beginning He desired to share His joy and His happiness with others. And so He created living beings. First of all, He created millions of angels, so that He might share His glory and His happiness with them. That was long before He created any man. Among the angels, God created one to be their leader. His name was Lucifer. That name, although it is considered an evil name now, was once the name of the most glorious, the wisest and the most beautiful of all the angels. He was the head of all the angels. "You were the perfection of wisdom and beauty ....I appointed you to be the anointed guardian angel.... You were perfect in all you did from the day you were created until that time when wrong was found in you" (Ezekiel chapter 28, verses 12 to 15). Unlike the stars and the trees that God had created, Lucifer and the other angels had a free will that could choose whether to obey God or to disobey Him. Free will is the first essential for a person to be a moral being. Stars and trees cannot do either good or evil, because they are not able to choose for themselves. They obey God's laws implicitly, because they have been created without freedom of choice. Therefore they cannot be sons of God either. A robot that a scientist makes may obey every order that he has programmed it to do, and it will never complain - unlike his own son! But that robot can still never become his son! The second essential for a person to be a moral being is conscience. Birds and animals can choose to do things voluntarily. But they are still not moral beings because they do not have a conscience. So they cannot be either holy or sinful. Therefore they cannot be children of God, for God is a moral Being. In fact those birds and animals can't be your children either. You may train a dog to obey every command you give it. But that dog can still never become your son, because your son must have your own nature - and your dog doesn't have that. But God made man in His likeness. That gives us the possibility of becoming His children. Conscience is that voice within us that reminds us that we are moral beings, and convicts us when we violate God's laws. The angels were created with both a free will and a conscience. Thus they were unique at that time in God's creation, for they were moral beings. Lucifer their leader, however, soon began to have thoughts and ambitions that were not good. This is where evil first began in this universe. Not only were Lucifer's thoughts not good, they were proud thoughts, rebellious thoughts and thoughts of discontentment. The universe had been perfectly pure up until then. But now evil reared its ugly head in the heart of a created being who had been created with a free will. Remember that evil had its beginning first in the heart. There was no external action initially. And evil begins in the heart, even today. Remember too that the first sin that brought evil into the world was pride. God then cast out Lucifer from His immediate presence. And Lucifer was called Satan from that moment. "How you are fallen from heaven, O Lucifer, son of the morning! How you are cut down - mighty though you were.... For you said to yourself, 'I will ascend to heaven and rule the angels. I will take the highest throne. I will climb to the highest heavens and be like the Most High. But instead you will be brought down to the pit of hell, down to its lowest depths" (Isaiah chapter 14, verses 12 to 15). But by the time Lucifer was cast out, he had managed to get a number of the other angels also to join him in his rebellion. There were millions of angels who joined him - in fact one-third of all the angels in heaven (as we read in Revelation chapter 12, verse 4). And so God cast them and Lucifer out. These fallen angels are the evil spirits (demons) that harass and trouble people today. Perhaps you yourself have been troubled by evil spirits or by others doing black magic on you. If so, the Bible has good news for you. You can be perfectly free from their harassment forever. Read through this book carefully and by the time you reach the end of it, you will see what miracles God can do for you. The question that some may now ask is, "If Satan is the cause of all the evil in the world, why doesn't God destroy Satan and all the other evil spirits?" God can certainly do that in a moment, if He wants to. This proves that God, in His infinite wisdom, has a purpose in allowing Satan and these demons to exist. Part of that purpose is to use Satan to make life on this earth difficult, insecure and dangerous for man so that people turn to God and think of eternity instead of seeking their comfort here on this earth. If life on this earth had been very comfortable, with no sickness, suffering, poverty, or misery, hardly anyone would have thought about God at all. So God uses all the misery and insecurity of earthly life to make us think about Him and to turn to Him in our need. Even the problems, the sicknesses and the trials that Satan brings into your life are all permitted by a loving God to make you turn to Him. They are in that sense an expression of God's love for you. This is the message of the Bible. There are people who do not think about God at all, until one day they are suddenly taken to a hospital with cancer or some other serious sickness. Then, all of a sudden they begin to think of God and turn to Him for salvation. Incurable diseases, sicknesses, poverty and many other evils in this world have all been used by God to turn people away from their sins. Thus God leads them to find their eternal home in heaven. That is how God uses the evil things that Satan does to save people from Satan's clutches and to bring them eternal salvation. Thus God makes a fool of Satan again and again. Satan is pushed into the very pit that he digs for others. Another reason why God allows Satan to exist is to purify God's children. Consider the example of fire? We know that millions of people have died through being burnt in fires in the history of the world. Yet no-one stops using fire, because of that. Why? Because it is through fire that food is cooked and that automobiles and airplanes and machines run. Gold too can be purified only through fire. So fire, though harmful and dangerous, can be put to very good uses. In the same way although Satan is evil and seeks to lead people astray, God still makes use of him. Satan is permitted to test God's children through various fiery trials and temptations, so that they can become holy and pure, like gold put through the fire. So we see that even though God can remove all the evil in the world in a moment, He does not do so, because He is accomplishing His glorious purposes through them all. Why do some men often behave like animals? The answer is: Because they are only interested in their bodily needs and in their existence on this earth. What is an animal interested in? Food, sleep and sexual satisfaction. That's all. And when a man is interested only in these things, we can say that he has descended to the level of the animals. But God didn't make man to be like the animals. He created us to be like Him - moral and upright, with character and self-control, and not a slave to animal passions. The fact that we are cleverer than the animals and that we are educated, doesn't make us better than them! Even clever, educated people are slaves to greed, selfishness, sexual lust, anger etc. There is a part of us that is deeper than our minds, and that is our spirit. Our spirit makes us aware of God. This is what no animal has. As we saw in the last chapter, God has made us as moral beings with the power to choose freely. But the danger of having freedom of choice is that we can use that freedom to please ourselves and to disobey God's laws. But God was willing to take that risk - because He wanted children, who choose Him freely. All the chaos, confusion, diseases and evil in the world are the direct result of man disobeying God and listening to the devil. The first man and woman that God created were called Adam and Eve. They were innocent when they were created. They had to make a choice if they were to be holy. And in order to make a choice, they had to be tempted, so that they could refuse evil and choose God instead. And so God allowed Satan to come along and tempt them. We read about this in the first book of the Bible, in Genesis chapters 2 & 3. There is a lot of difference between innocence and holiness. Innocence is what you see in a baby. If you want to know what Adam was like when he was created, look at a baby - innocent, and ignorant of good and evil. But that little baby is neither holy nor perfect. In order to become perfect, that baby will have to grow up and make some choices, refusing the evil and choosing God. It is when we refuse to yield to temptation in our minds that we develop character. You are what you are today because of the choices that you have made in your life thus far. If others around you are better than you, it is because they made better choices in their lives than you did. We are all making choices everyday - and those choices determine what we finally become. When God made the first man and woman, He gave them the opportunity to become holy by allowing them to be tempted by Satan. He placed them in a garden and told them that they could eat of every tree in that garden except one. That was a test. In fact, it was a very easy test - for they were sent into a garden having thousands of attractive trees with luscious fruit, and told that they could eat all of that, except the fruit from one tree. But they failed in that simple test of obedience. For Satan came along into that garden and tempted Adam and Eve saying that if they ate of that forbidden tree, they would be like God. The temptation that Adam and Eve faced at that time was not just a simple matter of eating the fruit of a tree, but of becoming like God if they wanted to. That was what Satan himself had at one time wanted to be. And that was what he told Adam and Eve that they could also be. Of course, what Satan told them was a lie - just like the lies that he deceives people with today. Just as people fall for Satan's lies today, Adam and Eve fell then. They disobeyed God and suffered the same fate as Satan did earlier. They were cast out of God's presence. All the details of that event can be read in the first book of the Bible - in Genesis chapter 3. Adam and Eve thought that by disobeying God's command they would be almighty and free, just like God Himself was. But did they become free? No! They just became slaves of Satan. It is only by OBEYING God's commands that we can become really free. This is where Satan deceives so many people. He tells them that if they want to really enjoy life they should ignore God's laws. Now we have seen how sin originated in the human race. Adam and Eve took a very important decision that day in the garden of Eden. It produced lifelong consequences for themselves and for their children. All the decisions that we take in life, produce consequences. We all have to reap what we sow. And many times, even our children have to reap the bitter fruit of what we sow. In Adam's case, he and his wife were sent out of God's presence for the rest of their lives. We should not imagine therefore that the little choices we make today are unimportant or that we will never reap a harvest in the future of what we are sowing today. God allows us to be tested and to be tempted through various people and various situations, so that we might prove to Him that we really want God more than anything on earth. That is the purpose of every temptation that we go through - to test whether we value the Creator more than all created things. The essence of all sin is to choose created things and ourselves above God. It is to choose our own way instead of God's way. It is to seek to please ourselves instead of pleasing God. Sin is not just committing adultery or murder or theft. It is wanting our own way. We see the beginnings of sin even in the stubbornness of a little child. Sin dwells within every child's nature from birth, and as he grows up, he is determined to have his own way, to grab and to fight with other children to get what he wants. As we grow up to manhood, we don't change much from what we were when we were children. We just become cleverer and change our methods! Even cultured people remain exactly the same. They just cover up their selfishness, their covetousness and their lust with an external veneer of graciousness, or perhaps even religion!! Sin has penetrated every fibre of our being. We cannot get rid of sin through religious exercises like fasting and prayer or through pilgrimages or self-control. God alone can save us from sin. But God has to wait until we recognize sin for the evil that it is. Jesus once said that He did not come to call the "righteous" but sinners. This did not mean that some people on earth were righteous and others sinners. He spoke that sarcastically to self-righteous religious people who considered themselves holy. Jesus meant that He could not save those who saw themselves as "righteous". Only those who RECOGNIZE that they are sick will go to a doctor. Even so our first need is to recognize that we are sinners. Whatever our religion may be, we are all sinners. We have sinned against God's holy laws, in thought, word, deed, attitude and motive. We have come short of God's holy standards. Sin is more damaging to our soul than sickness is to our body. But do we recognize this? What is your reaction to AIDS - the dreaded sexually transmitted disease that is spreading around the world today? AIDS is so contagious, that people are afraid to go anywhere near anyone who has that disease. Sin is actually worse than that - the only difference being that the damage that sin does is to our souls. So it is not visible externally. Sin's effects however are far worse than those of AIDS. It ruins our lives, makes us unhappy here in this world, and will finally destroy us in eternity - if we are not saved from it. We have all been created with a conscience that constantly reminds us that we are moral beings. Conscience is God's voice within us telling us that we are responsible for our actions. One day, we will have to give an answer to God for the way we have lived our lives. We are not like animals, who have no conscience. Animals are not moral beings and so they don't have to answer to God for anything. When an animal dies, that is the end for it. But not so for us. Man was created in the image of God and is an eternal being. For us there will be a day of judgment. Then everything that we did, said and thought during our entire lives will be brought back to our minds, and assessed by God. And He will judge us according to the standard of His holy laws given in the Bible. We will then have to give an answer to God for every single action, word and thought. The Bible says, "It is destined that men die only once, and after that comes judgment" (Hebrews chapter 9, verse 27). Many men escape punishment for their crimes here on earth. But they will get their just punishment when they finally stand before God's judgment-seat. Likewise, many men have never been appreciated or rewarded here on earth for all the good that they did to others. They will be rewarded when Christ comes back to this earth. Since we have to give God an answer one day for whatever we do, it is important that we listen to the voice of our conscience always. Conscience is one of God's greatest gifts to man. It is like the gift of "pain" in our bodies. Most of us think of pain only as a nuisance. But we don't realize what a tremendous blessing pain is to our lives. For it is through pain that the body warns us that something is wrong somewhere. It is the body's first signal, warning us of sickness. If it were not for pain, we would not even know when we have a sickness, and we could die. It is pain that saves us from premature death. Lepers don't feel pain, because leprosy kills the nerves and destroys all sensation. A leper could get a nail through his foot and never feel it at all. The foot will get infected - and he still won't know about it. Finally his foot will get so bad that it will have to be cut off - all because he did not have the "blessing of pain". Conscience is like pain. It warns us when we violate God's laws - when we are thinking of sinning, or when we have already sinned. If we ignore its warnings, and go against it, we will gradually kill the sense of sin within us. Then a day will come when we won't feel any sensitivity to sin at all. Then we will become spiritual lepers - with a dead conscience. We would then be like the animals that have no conscience. That is why some people behave worse than animals. The final result of such a life is to be punished eternally by God. We all know we are sinners, because our conscience tells us that. We must never shake off that sense of guilt, because that sense of guilt is like "the blessing of pain". It tells us that we are spiritually sick and that we need to be healed. Conscience is God's greatest gift to man. Jesus likened the conscience to the eye (Luke chapter 11, verses 34 to 36). Our eyes are the cleanest parts of our body, because they are being washed many, many times every day, by our tears. Every time our eyelids blink (and that happens thousands of times in a day, without our even realising it), our eyes are being washed of all dust. Even a small speck of dust is enough to irritate our eyes and make us stop all our work, until we have washed our eyes clean. That is how we must also keep our conscience - always clean. Our sins can be forgiven and cleansed away only by God. That is the only way for our conscience to be cleared of its sense of guilt. But forgiveness of sins is NOT cheap. How can God forgive our sins? God is a just and righteous God and He cannot forgive a person by OVERLOOKING his sins. That would be unjust. God is a holy and just God. And so He has to punish sin. But because He is also a loving God He has made a way for our sins to be forgiven. All religions teach us to be good, kind and truthful. But all these refer to how we must live after we have received forgiveness for our sins. Goodness, kindness and truthfulness are all like the superstructure of a building. Forgiveness of sins is the foundation of that building. The most important part of a building is the foundation. For God to forgive our sins, He had to do something that was more difficult and more painful for Him than when He created the world. For creating the world, God had only to speak a word, and the world came into being immediately. But He could not forgive our sins by just speaking a word. If man's sins were to be forgiven, there was only one way. God had to become a man like us. He had to live through the temptations and struggles that we face as human beings. And He had to die as a sacrifice in our stead, taking the punishment for our sins upon Himself. The punishment for sin is not suffering or sickness or poverty, or being born into this world again on a lower social scale, or any such thing. It is eternal death - which is the same as being separated from God for ever. Physical death is being separated from our physical body. Even so, spiritual death is being separated from God the Source of all life. Good works that you do in the future can never atone for the evil that you have done in the past. Sin is a debt that we owe to God's Laws. If we disobey the laws of the country, say by cheating on our taxes, we cannot be forgiven just because we promise to pay our taxes in future. No. Even if we pay our taxes in future, we still have to pay for what we owe from the past. It is the same with sin. However many good works we may do in the future, we still have to pay for the sins we committed in the past. Besides, the Bible says that "our best works are like filthy rags in God's sight" (Isaiah chapter 64, verse 6). God does appreciate good works. But even our best works do not meet the standards of His holiness, for He is infinitely holy. So we are in a hopeless condition, for even our good works are not good enough. There is no way by which we can ever enter God's presence. But God in His great love has yet made a way by which our sins can be forgiven. God is so complex that our human minds cannot understand Him fully. The Bible reveals God as One, but yet being Three Persons in that Oneness - known to us as Father, Son (meaning that He has the same nature as the Father, and NOT that He was born through the Father) and Holy Spirit - all equal with each other. It is impossible for our human minds to grasp how three separate persons can still be One God. We can only think of persons having separate bodies. But God is Spirit. Our minds are limited. They cannot grasp the complex nature of God. Just like a dog cannot understand things that human beings understand, there are also things about God that we human beings cannot understand. We can only know what God has chosen to reveal to us in the Bible. No more. For example, you may be able to explain addition to a clever dog - that 1 + 1 + 1 = 3, by placing three bones in front of it, and then counting them one by one. You will find that even the cleverest dog cannot understand that! Yet we human beings know very well that three 'Ones' still make 'One' when multiplied with each other! Now God is far higher above us than we are above the dogs. A dog would have to be human to understand multiplication. We would have to be God ourselves in order to understand God. So it is not surprising if we cannot understand that God is Three Persons and yet One God. Even though we don't understand it, we know it is true, for God says so in His Word. In the same way, many use human logic and say that if God is everywhere, then God must be in every human being, animal and plant, and in every religious place of worship. This sounds logical to the small human mind that has not understood Divine truths. But it is totally false. God is everywhere in the sense that He knows everything of what is going on everywhere. But He is certainly not in Hell, even though he knows what is going on there. The very meaning of Hell (eternal punishment for sinners) is "a place where God is absent". That is what makes the suffering of sinners in Hell unbearable. So God certainly does not dwell in everyone. To save humanity from eternal punishment for its sins, God the Father sent the Son to be born as a baby, through a virgin, by the supernatural operation of the Holy Spirit, nearly 2000 years ago. He was named Jesus Christ. He grew up from childhood to manhood, facing every temptation that human beings face. And in all those temptations He overcame. He never sinned at all. God the Father allowed Jesus Christ, the Son, at the age of 33, to be taken by wicked men and crucified on a cross. On the cross He became a curse for our sake, and took the punishment for the sins of mankind. There we see the tremendous love of God. When Jesus Christ died on the cross, and shed His blood, the righteous penalty for our sins was paid fully. The demands of justice had been met. God raised Jesus Christ from the dead, three days after He was buried, to prove to the world that His sacrifice on the cross had been accepted. 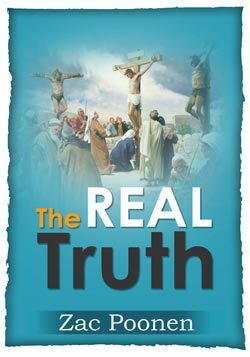 The Lord Jesus Christ was the Only One Who died for the sins of the world. The Lord Jesus Christ was the Only One Who came back alive after being dead, never to die again - thus proving that He had conquered man's greatest enemy, death. After forty more days on earth, Jesus returned to heaven where He is today. He promised, before He left, to come back one day to judge the world and to rule it in righteousness and peace. He gave us certain signs that would precede His coming back to earth. As we see those signs being fulfilled now, we know that the second coming of Christ is very, very near. Before He returns to earth, it is important that you receive the forgiveness that God offers you in Christ. The punishment for sin is spiritual death - which as we have already seen, means to be cut off from God's presence forever. That is what Jesus experienced on the cross. He was forsaken by His Father. Jesus being God, and therefore eternal in His inner person, could experience the agony of eternal separation from His Father in a short time - in three hours of total darkness on the cross, when He suffered the pains of eternal hell, the pains that we should have suffered for all eternity. The penalty for our sin has been taken by Him. But we are still not forgiven and freed from that penalty unless we receive that forgiveness from God. This is the reason why most people in the world remain in an unforgiven state - even though Christ died for them. Christ died for the sins of the whole world, for people of every religion, and not just for the sins of Christians. To receive what God has purchased for you through Christ's death, you must first of all repent of your sins. This means that you are truly sorry for your sinful ways, and that you desire sincerely to turn from every sin that you know. In the beginning, your conscience is not sensitive as to what pleases God and what does not please Him. So it is impossible for you to turn from everything that is displeasing to God in your life. And God does not demand that - for He is realistic. He only asks you to be willing to give up everything that will displease Him. You can make a beginning by turning away from those things that your conscience convicts you of. You may not have the strength to give up your bad habits. Here again God understands your weakness fully. He does not expect you to have the strength. He only asks you, "Are you willing to give up those habits?" When He sees that you are sincere and that you truly desire to give up everything sinful, He will accept you just as you are, even if you are still defeated by numerous bad habits. What wonderfully good news this is. One proof that you are willing to give up your old sinful ways is shown by your willingness to set right the wrongs that you have done in the past. And even here, God understands your limitations. There are thousands of mistakes and sins that you may have committed in the past that you may never be able to set right, no matter how hard you try. But there are some that you can. God expects you to set things right only to the best of your ability. For example, if you have stolen money from someone, you should be willing to return it, as soon as you have saved that amount of money. If you have hurt someone with your words, and you remember it, you must be willing to go (or write to him) and ask his forgiveness for what you said. Such actions are the means by which God will test your sincerity and humility. He gives His help only to the humble. And without God's help we cannot be saved. The Bible calls true repentance a "turning to God from idols" (1 Thessalonians chapter 1, verse 9). It is primarily to put some created thing above the Creator - whether that created thing be money, or a pretty woman, or our reputation, or anything. To choose any such created thing is idolatry - for it is worshipping the created thing instead of the Creator - and that is the root of all sin. God hates any such idolatry, because it takes the place that He should have in the heart of man - and thus destroys man. Idols can also be physical objects made by man to represent the god he worships. But it is impossible for anyone to fashion with his hands or to draw a painting of anything that even remotely resembles the beautiful and wonderful and almighty Creator of the universe. It is an insult to God the Creator to make His image in the likeness of anything He has created. God is a Spirit and He is invisible to the naked eye. He has given us all a conscience to remind us day and night of Him. But religious activities and pilgrimages often become substitutes for listening to the voice of conscience. When people violate God's laws, and plan to continue to violate them in the future as well, they seek to stifle the voice of their conscience by going through various religious rituals and activities. They imagine that God will forgive them their many sins because of the sacrifices and the pilgrimages they make. But this is a deception. God doesn't look at our religious rituals and activities. He looks at our hearts, to see whether we listen to our conscience or not. So repentance involves turning away from idolatry of every sort. In true repentance, we turn from all created things to the Creator, and say to Him, "Almighty God, You alone are worthy to be worshipped and served. I am sorry for having worshipped created things so far. You alone will be supreme in my life from now on." Repentance does not mean that we have to give up our jobs, or our families, and go as hermits to some forest or mountain. No. God wants us all to have families, and to work to earn our living. It is not a sin to earn money. But it IS a sin to love money more than God. It is not a sin to use the comforts that modern civilization provides us with. But it IS a sin to love those comforts more than we love God. God has created our bodies in such a way that they can experience the pleasure of food, sleep, and sexual satisfaction. There is nothing wrong with any of these. We don't have to be ashamed of our sexual desire any more than we are ashamed of the fact that we are often hungry or tired!! But we should not steal food when we are hungry, and we should not be sleeping when we should be working at our jobs!! In the same way, we should not violate another person in order to satisfy our sexual desires. God has ordained marriage - He expects one man to have one wife - so that the sexual desire can be fulfilled. Outside of marriage, any sexual relationship is sin. We must repent of all sexual sin and forsake it, and turn to God in sincerity. Another sin that you must repent of and give up is an unforgiving attitude towards others. If you want God to forgive your sins you must be willing to forgive all who have harmed you in any way. You must do to others as God has done to you. If you are unwilling to do this, God will not forgive you. "If you refuse to forgive others, your Heavenly Father will not forgive you" (Matthew chapter 6, verse 15). You may find it extremely difficult to forgive someone who has harmed you immensely. You can then pray and ask God to help you to forgive that person. The Almighty power of God is available to help you to do this. Nothing will be impossible for you to do, if God helps you with His almighty power! God can forgive all our sins, however great or evil they may be - but only if we repent of them - that is, if we are truly sorry for our sins, and sincerely want to give up our old sinful ways. Once we have repented, the next requirement for receiving God's forgiveness is faith. "By grace you are saved through faith" (Ephesians chapter 2, verse 8). Grace is God's Hand reaching out to give us His help and His blessings. Faith is our hand reaching up to take that help and those blessings from God's Hand. As we saw earlier, God does not want mindless robots who do things, just because He programs them to do so. No. He wants us to make a choice. Do you believe that God is a good God Who loves you greatly? Do you believe that that God sent His Son the Lord Jesus Christ to die for your sins on the cross and that God raised Him from the dead after three days and that He is living in heaven today? If so, then you can receive the forgiveness that God offers you right now. You don't have to wait. There is no other Name on earth, other than the Name of the Lord Jesus Christ, in which salvation from sin can be found. If you want to receive Him as your Lord and Saviour, it is essential, just as in marriage, to "forsake all else and cleave only unto Him". In marriage, a woman has to give up all her former lovers and cleave just to one man as her husband, for the rest of her life. The Bible likens our relationship with the Lord Jesus Christ to a spiritual marriage, where He alone is our Divine Husband. You cannot therefore say that you are willing to receive Christ and still worship or pray to other gods. You have to make a choice. If you want to make that choice, now is the time. "Lord Jesus Christ, I am a sinner and I truly want to turn from all my sins. I believe that You died for all my sins, and that You rose again from the dead and that You are alive today. Please forgive me all my sins. Come into my heart and life and become Lord of my life from today onwards. I forsake all other gods and I want to worship You alone from now on." That is a very simple prayer that will take you less than a minute to pray. But if you pray it in all sincerity, your soul will be saved for all eternity. You will become a child of God immediately. This is no magic formula that will bless all who repeat it like a parrot. It all depends on the sincerity of your heart. If you mean what you are saying, God will forgive your sins, accept you and make you His child. If you are insincere, then you will remain unchanged. God will never force anyone to receive Christ into his life. And neither will any true Christian force anyone to receive Christ. Forced conversions are not conversions at all. The assurance that we have truly been forgiven and accepted by God and that He has made us His children is very important. God does not want us to remain without this assurance. God gives us this assurance through His Holy Spirit coming into our hearts and telling us that we are God's children. God also assures us through the promises He has given us in His written Word (the Bible). "The one who comes to Me I will certainly not reject" (John chapter 6, verse 37). We can rely totally on that promise of Christ for all eternity. Did you pray that prayer just now in sincerity to the Lord Jesus Christ? Then you have indeed come to Him. Then you can be certain that He has not rejected you. He has accepted you. If you have done your part in coming to Him, you can be sure that God has done his part in accepting you. You don't have to depend now on your feelings, as to whether you feel accepted by God or not. Feelings have to do with our physical bodies - and are always very deceptive on spiritual matters. To put our trust in feelings is like laying the foundation of a house on sand. We must put our faith in God's promises in His Word - and that is like building on a rock. Once you are sure of the fact that you have become a child of God, you should confess that fact publicly. The Bible says that what you believe in your heart, must be confessed with your tongue. So you must confess with your lips that Jesus Christ is now your Saviour and your Lord. You must tell your friends and relatives that Christ has forgiven your sins and that He is now the only Lord of your life. You must then confess to your relationship with Christ through baptism. As soon as possible after you have made the decision to give your heart and life to Christ, you must be baptized. Baptism is not a religious ritual. It is a public testimony to God, to men, to angels and to Satan that you belong to Jesus Christ alone now. In baptism, another Christian will immerse you completely into water (either in a river or in a tank) in the Name of the Father, Son and the Holy Spirit, and then lift you up again out of the water. In that simple act, you will be testifying to the fact that the old person that you were, has died. You bury him symbolically in the water by total immersion. Coming up out of the water, you acknowledge that you are now a new person (raised from the dead, spiritually speaking), wanting to please God alone. You have not become perfect yet. It will take you a lifetime to become perfect. But you have changed the direction of your life. Now, you don't want to sin or to displease God any more. You have become a citizen of heaven now, and a child of God. The Name "Jesus" means "Saviour". He came to earth with that Name, because that was what He came to do - to save people from their sins. Salvation is more than forgiveness. Let me use an illustration to make the difference clear. Let us say that the road outside my house is being repaired, and that a deep pit has been dug there. I warn my little boy, saying, "Don't go near that pit, for you might fall into it." But let us say that he disobeys my command and goes near the pit to have a look inside. And he slips and falls inside. From inside that 10-foot pit, he then cries out, calling me. When I come there, he tells me that he is truly sorry for disobeying my command, and asks me to forgive him. Supposing I then say to him, "All right son, I forgive you. Good Bye! ", what would I have done. I would have forgiven him. But I would not have saved him. Salvation would involve more than forgiveness. It would involve my pulling him out of the pit that he has fallen into. This is what Jesus has come to do for us too. It is not enough that He forgives us our sins. He has come to save us from our sins too. We have all fallen deeply into the pit of sin, by disobeying our conscience again and again. Now if God were to forgive us, that by itself would be wonderful news. But the good news of Christ is that He will not only forgive us, but save us from the power of sin as well. Salvation is to be experienced by us in three tenses - past, present and future. We must first of all be saved from the penalty of sin. Then we must be saved from the power of sin. Then finally, we will be saved from the very presence of sin, when we get to heaven. The first part of salvation deals with the forgiveness of our sins - the removal of the guilt of our past. But that is not enough. We need help from God to live uprightly in the future too. And for this, God gives us His power. I heard a story of a mental hospital where people who were mentally unsound were admitted for treatment. They used a test there to find out whether some of their inmates had been cured to the point where they could reason properly. They would put an inmate in a room where a tap was constantly gushing out water. They would then give him a mop and a bucket, and ask him to dry the floor. If he tried to do that without first closing the tap, that would indicate that he has not come to his senses as yet!! That is our problem too. There is a tap within us that is constantly gushing out sin. Jesus not only mops up the sins that we have committed. He gives us power to close the tap as well. Otherwise the gospel would not be good news at all. The gospel (good news) is described in the Bible as "the power of God for salvation" (Romans chapter 1, verse 16). The first source of power is God's Word. The Bible is a powerful weapon that can help us overcome temptation. We read in the Bible that Jesus Himself overcame Satan's temptations through the power of God's Word (Matthew chapter 4, verses 1 to 11). That is why we must develop the habit of reading God's Word every day, so that God can speak to us through it and strengthen us to face the battles of daily life. The Bible says to young men, "You are strong, with God's Word in your hearts, and you have won your struggle against Satan" (First Epistle of John, chapter 2, verse 14). The second source of power is the Holy Spirit of God Who comes to live within us. He wants to live within us permanently to speak to us daily, to strengthen us to face life's struggles, and to help us to follow in Jesus' footsteps as His disciples. We must ask God to fill us with the Holy Spirit continuously. The Lord Jesus Christ said, "If even sinful persons give their children what they need, don't you realize that your Heavenly Father will do at least as much, and give the Holy Spirit to those who ask Him" (Luke chapter 11, verse 13). A third source of power is fellowship with other like-minded Christians. When many coals are together in a fire, they all burn brightly. But if one coal is taken out (even if it is the most brightly burning one), it will soon die out. That is how it will be with us too, if we try to live for God all by ourselves, without fellowship with other Christians. But it is here that we have to be careful, for not all who call themselves "Christians" are true Christians. In fact, it would be safe to say that 90% of those who call themselves Christians are not children of God (whatever Christian group or denomination they may belong to). They have not made a personal decision to give up their sins and to receive Christ as Lord of their lives. They imagine themselves to be Christians because of "the accident of birth" - that is, they were born into Christian families. We must avoid such people who are only Christians by name, and seek our fellowship with those who have become Christians by experience, who are seeking to follow Jesus Christ in their daily lives. When we receive Christ as our Lord and Saviour, the Bible says that we are born from above, for we have become children of God. God is now our Father. And just like earthly fathers, God is also keen on providing us with all that is necessary for our life on earth - both spiritually as well as physically. The Lord Jesus Christ said that if we sought God's interests first in our lives, then all the other things necessary for our life on earth will be added to us. He said, "Your heavenly Father knows perfectly well what you need. And He will give them to you, if you give Him first place in your life, and live as He wants you to" (Matthew chapter 6, verse 33). One of the greatest privileges that the child of God has is the privilege of prayer - to talk to Almighty God, and to hear God talking to him in his spirit. God does not usually speak to us in a voice that we can hear with our ears, but with an impression on our spirit within, that is just as real as an audible voice. Jesus encouraged us to tell God everything that burdens our hearts. Many people suffer silently, because they have no-one to share their sorrows with. But the child of God has a Father in heaven with whom he can share everything. He can also trust His Heavenly Father to provide everything that he needs on this earth. The Lord Jesus Christ taught us to change things by asking God to change them. This is the miracle of prayer. We don't have to fatalistically accept everything that happens to us (saying, "Whatever happens is the will of God") if such things are harming us or our families in any way. Fatalism is different from submission to the will of God. We are encouraged to ask God for whatever we need. The promise in the Bible is, "God will supply all your need" (Philippians chapter 4, verse 19). But like every wise father, God also will not give us everything that we want and that we ask Him for. He will only give us what we need, and what He sees will be good for us. God is a good God, and He never desires that any evil should come to any of His children at any time. So we can go to Him boldly, and ask Him to deliver us from ALL evil. There are many people in the world who are suffering because others have done some witchcraft or black magic on them. If you have given your heart and life to Christ, such Satanic activities cannot harm you anymore. You can use the Name of the Lord Jesus Christ (Who defeated Satan) to drive Satan away. No witchcraft or black magic can ever harm you or even touch you or your children, if you resist it in the Name of Jesus Christ. The power of any witchcraft done on you can be cast off right now - this very moment - if you will call upon the Name of the Lord Jesus Christ to save you. The Bible says that when Jesus died on the cross, He defeated Satan and took away his power. That has already taken place. But as in the case of the forgiveness of your sins, here too, the defeat of Satan cannot become a reality in your life, until you accept it yourself. "By dying, He (Jesus) broke the power of the devil. Only in that way could He deliver those who were living all their lives as slaves to constant fear (of Satan)" (Hebrews chapter 2, verses 14 & 15). "Give yourselves humbly to God and resist the devil and he will flee from you" (James chapter 4, verse 7). Even after we become children of God, God will still allow Satan to tempt us - because that is how we are going to become strong. But now we have the power of God's Holy Spirit dwelling within us, to give us power to resist and overcome all of Satan's attacks. God has not promised that the earthly lives of His children will be free from trials and problems. No. God wants us to be rugged and strong and not like the spoilt children of rich parents who are pampered from birth. And in order to make us strong, He allows us to face trials and problems in life just like other human beings. But it is in those trials that we come to know God better, as we experience His miraculous help in every situation. For one who has become a child of God, the things of eternity are more valuable than the things of time. The values of heaven become more important to him than the values held here on earth. When the Lord Jesus Christ ascended to heaven, after rising from the dead, 2000 years ago, He promised to come back to this earth. This is referred to as "The Second Coming Of Christ". This is the next great event in the history of this world. A child of God realizes that he must give an account of his whole life to God on that day, when Christ comes back to this earth. This world is only a passing phase in our journey towards eternity. We are on probation here now. God is testing us now through the circumstances of life to see whether we choose the eternal things of heaven or the temporary things of this earth. If we are wise, we will choose the things that will have value in eternity. A small baby will prefer a shiny, coloured paper to a 500-rupee currency-note - because the baby has no sense of values. When we prefer the things of this earth to the things of heaven and eternity, we are behaving just like that little baby. God has told us very clearly in the Bible that this world and everything in it will pass away. To live for the temporary things of this earth is therefore like putting money in a bank that is going to crash very soon. A wise person will put his money into a bank that is stable. In the same way those who are truly wise will live for the things that have eternal value - things related to our character like purity, love, goodness, forgiveness, humility etc., which are the only things we can take with us when we leave this earth. The Bible tells us that the final end of all who die without repenting of their sins is going to be terrible. "It is appointed to men to die once and after this judgment" (Hebrews chapter 9, verse 27). Once a person is dead, there can be no more opportunity for him to change. God also cannot change such a person, because God does not change a person against his will. It is only when we are willing to change, here on this earth, that God can change us. In a coming day in the future, every person who ever lived on this earth will be raised up from the dead to give an account of his life to God. The Bible says that there will be two resurrections - that is, the dead bodies which have become dust will be raised as bodies again, by the supernatural power of God. The first resurrection will be for those who are righteous - those who received Christ as their Saviour and who had their sins forgiven, and who thus became children of God while they were on earth. The second resurrection will be for those who rejected the forgiveness that God offered them through the Lord Jesus Christ and died in that state. If a person dies without repenting of his sins and without his sins being forgiven through Christ, he will one day be judged at the judgment seat of God where his whole life will be reviewed. Then it will be proved to the whole universe that he deserved eternal judgment for his sins. Satan who started all the evil in the universe, and who has been the cause of leading men into sin will also receive an eternal punishment at that time. Those however, who humbled themselves and acknowledged their sins and confessed and forsook them, and accepted God's offer of forgiveness through Christ's death on the cross, will enter into God's presence and dwell with Him for all eternity. Heaven is a place of purity, peace and joy, where the angels and those from the human race who have been saved from their sins, will worship and praise God and serve Him in various ways for all eternity. It will be a place of joyous re-union with our loved ones who have left this earth before us, if they had died as children of God, trusting in Christ for their salvation. The true child of God looks forward to that glorious day when he will be with God forever. Now that you know THE REAL TRUTH, what is your response going to be? Did you pray that prayer asking the Lord Jesus Christ to forgive you your sins and to make you a child of God? The time to pray that prayer is now, when God is speaking to your heart. None of us can say when we will die and leave this earth. One of these days will be our last day on this earth. Before that day comes, make sure that your sins are forgiven and that you are ready to meet God.